Currently, we are OPEN on Weekends and Easter Monday. We close after easter monday, as of April 23rd for the inter-season. The restaurant will stay closed until July. To be precised later on. 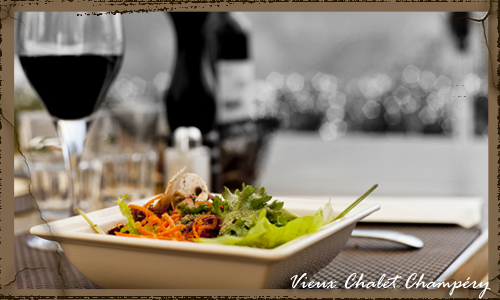 The Restaurant « Le Vieux-Chalet » is located in the nice mountain village of Champéry, in the Portes-du-Soleil domain. The quality of the products and dishes as well as the love of cooking and conviviality are things to which we pay attention. Welcome and satisfaction are important. We propose dishes costing between 19.50 and 52 CHF.Our specialities are meats grilled in the chimney as Beef ribs, Chateaubriand, rack lamb, Pork’s slice, or entrecote. We cook it in front of your eyes in the chimney that stands in our restaurant room or on the outside grill of our panoramic terrace facing the Dents-du-Midi Mountains. But we also have a selection of salads and casseroles, and the famous Valais’ specialties (Fondues, plates of dried meat or regional cheese). For your pleasure and according to the seasonal products, several suggestions are added to our main menu. Come and enjoy it! For your events, if you need accommodations, we work together with our neighbour the hotel Beau-Séjour. This little hotel is a jewel of our valley. Do not hesitate to come and meet with us or make an appointment for your wedding, birthday party or dinner, Christmas or New Year’s Eve dinner or any other event. We share our experiences in event planning to create an unforgettable moment in a typical, authentic and warm atmosphere.